Cubby is a very special Dalmatian. One of just a small number of NUA (normal uric acid) Dalmatians in the world, he is sired by our own Boo. Cubby is co-owned and lives with Amy in Coral Springs, FL. Cubby completed his IABCA International Puppy Championship in 2008with two Reserve Best Puppy in Show awards and his International Championship with two Group II's and a Group I.
Cubby's UKC career was equally exciting with a several group placements and a BEST IN SHOW to finish! Cubby is also working in obedience and agility and recently competed in his first UKC Rally Trial, earning 2 legs towards his Rally Novice Title. 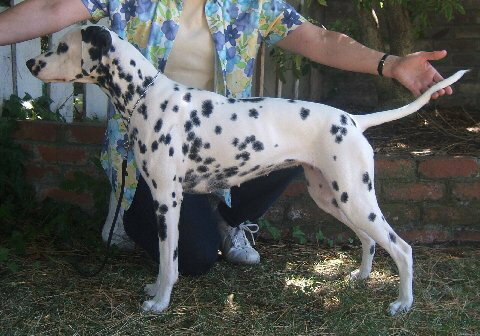 Cubby was the second LUA Dalmatian to be AKC registered, the first to be shown in December 2011 and the second LUA Dalmatian to finish an AKC Championship. He quickly made his mark and finished in just 8 months with a Specialty Best of Winners under breeder/judge John Mederios. Cubby thrilled us by completing his Road Dog title at the MFDC 2010 Road Trial and by being the FIRST NUA Dalmatian to earn the Road Dog title! Breeders: Denise Powell & Lesley Beals Owner: Amy Marrich & Mary-Lynn Jensen, Ph.D.